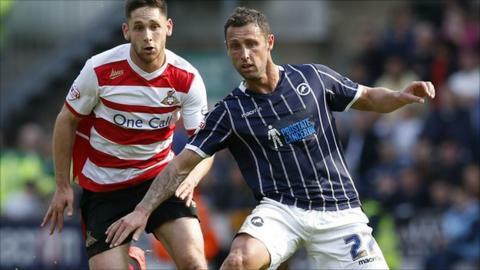 Millwall and Doncaster earned what could prove to be a valuable point in their attempts to avoid relegation from the Championship. The pair are one point above the bottom three with two games left and have four teams below them. Abdoulaye Meite was sent off for Doncaster following his mistimed challenge on Stefan Maierhofer. However, Sam Johnstone was inspired in the visitors' goal denying Shaun Williams and Steve Morison. The Lions are still searching for their first home win since January but they started the brighter of the two sides when Scott McDonald collected a Maierhofer flick, but his close-range shot deflected wide off Gabriel Tamas for a corner. The game changed moments before half-time when Ivorian Meite was dismissed after diving into a high, mistimed tackle on Maierhofer, leaving referee Fred Graham no choice but to show a red card. Millwall made their numerical advantage count after the break as the home side laid siege to the Doncaster box. Williams' long-range effort forced a magnificent save from of Johnstone and the goalkeeper then tipped a thunderous Morison volley over the bar before watching the former Norwich striker head a deep corner against the frame of the goal. At the other end, Doncaster had a penalty claim dismissed when goalkeeper David Forde fumbled a cross and bundled over striker Chris Brown. A last-ditch challenge from Rovers' impressive Paul Quinn prevented Simeon Jackson tapping into an open net 10 minutes from time. Millwall boss Ian Holloway: "I'm not disappointed at all, I'm pleased with the performance. Doncaster boss Paul Dickov: "I'm immensely proud of the players, especially the second-half performance. Match ends, Millwall 0, Doncaster Rovers 0. Second Half ends, Millwall 0, Doncaster Rovers 0. Attempt blocked. Nicky Bailey (Millwall) right footed shot from outside the box is blocked. Assisted by Shaun Williams. Substitution, Doncaster Rovers. Jamie McCombe replaces Theo Robinson. Attempt blocked. Steve Morison (Millwall) right footed shot from the centre of the box is blocked. Assisted by Mark Beevers with a headed pass. Attempt missed. David Cotterill (Doncaster Rovers) right footed shot from outside the box is too high from a direct free kick. Nicky Bailey (Millwall) is shown the yellow card for a bad foul. Corner, Millwall. Conceded by Gabriel Tamas. Attempt missed. Lee Martin (Millwall) right footed shot from the centre of the box misses to the right. Assisted by Shaun Williams with a cross following a corner. Corner, Millwall. Conceded by Paul Quinn. Attempt saved. Steve Morison (Millwall) header from the right side of the box is saved in the top right corner. Assisted by Mark Beevers. Attempt blocked. Paul Keegan (Doncaster Rovers) right footed shot from outside the box is blocked. Attempt missed. Shaun Williams (Millwall) left footed shot from outside the box is too high. Attempt saved. Scott Malone (Millwall) header from the left side of the box is saved in the top centre of the goal. Assisted by Lee Martin with a cross. Chris Brown (Doncaster Rovers) wins a free kick on the left wing. Substitution, Millwall. Jermaine Easter replaces Scott McDonald. Attempt missed. David Cotterill (Doncaster Rovers) right footed shot from the left side of the box is close, but misses to the left. Assisted by Dean Furman. Attempt missed. Lee Martin (Millwall) right footed shot from outside the box is high and wide to the right. Assisted by Scott Malone with a headed pass. Steve Morison (Millwall) hits the bar with a header from very close range. Assisted by Lee Martin with a cross following a corner. David Cotterill (Doncaster Rovers) is shown the yellow card. Offside, Doncaster Rovers. Paul Keegan tries a through ball, but David Cotterill is caught offside. Attempt missed. Scott Malone (Millwall) left footed shot from the left side of the box is too high. Attempt saved. Steve Morison (Millwall) right footed shot from the right side of the box is saved in the top right corner. Corner, Millwall. Conceded by Dean Furman. Foul by Carlos Edwards (Millwall).